Janet brings over 20 years of experience, as a highly credentialed Occupational Therapist, to the barre teaching team. She spent nearly 10 years, as the Senior Occupational Therapist for the Shock Trauma Center in Baltimore. Janet is a busy mother of three small boys, a fitness instructor and enjoys her hobby of participating in triathlons. After taking her first barre. , class she knew she had found what had long been missing in her own fitness regime. Janet is both thrilled and honored to be joining the barre. team. 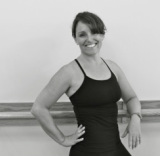 By incorporating her knowledge of anatomy and kinesiology, she hopes to assist clients in deepening their barre. practice. By working towards perfecting our clients form, she will maximize all the wonderful benefits barre. has to offer.